Dr Jain was born and brought up in India : the land of Yoga, Ayurveda and Spirituality. She grew up in a family of engineers, physicians, surgeons, doctors and scientists. For many years she was recognized as one of the finest of yoga students. She learnt the science of yoga in great depth even as she was getting her formal school education. During her high school years she became her State and then the all India Yoga Champion for three consecutive years. Her Medical School training was done in the beautiful cities of Ajmer and Jaipur in India. After migrating to USA in 1992, she completed her residency training in Internal medicine and then the fellowship training in Geriatric Medicine at the University of Pittsburgh Medical Center (UPMC), PA, USA. As a resident and fellow, she showed keen interest in integrative and complementary medicine when she worked with Louis Mehl Medrona, MD at the Center for Complementary Medicine, UPMC. 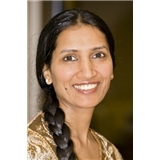 She joined Henry C Downs, MD, an integrative medicine practitioner, in 1999 at Walnut Creek, CA. She got the opportunity to start her own medical practice in 2000. She has since then developed, designed and delivered many ways of treating and managing true health and has coached her numerous loyal clients the science of inner well being. During the course of nearly two decades of her practice, Dr Jain came to the realization that merely working at the body and disease level is not only limiting our full potential but also depriving the patients of a complete holistic treatment from within. The many more dimensions of human existence need to be opened up, felt and included in the regimen for healthy living. In this endeavor, her work teaches everyone how to understand the higher levels of consciousness within to heal one's own body, mind and soul. Dr Jain continues to offer her services as an alternative/integrative medicine provider to adults and seniors incorporating the wellness principles of Ayurveda, Yoga and Preksha Meditation. She got her training in Preksha Meditation at the Preksha Center, New Delhi, India. Her deep connection with spirituality and her yearning for soul wellness brought her back to India many times over the years to directly experience, see and learn the ancient and authentic wisdom of yoga and Ayurveda at various places including Kottakal Ayurvedshala, Kerala, Santhigiri Ashram, Kerala, Ayurgram, Bangalore, Patanjali Yog Peeth, Haridwar, Vivekanand Yog Institute, Bangalore, Ayurveda Hospital, Jaipur and many more places throughout India. In her current practice she runs an Integrated Wellness program that incorporates Ayurveda, Yoga, Meditation, Spirituality, Quantum Biofeedback and various other deeper healing techniques. Her healing experience to her clients is very powerful as she works closely with many other physicians, therapists and practitioners who specialize in Western Medicine, Chinese Medicine, Chiropractic Medicine, Osteopathic Medicine, Naturopathic medicine, Homeopathic medicine and Ayurvedic Medicine.She is also associated with the Sivananda Institute for Health and Yoga as a faculty to train health care practitioners and empower them with classical Yoga tools and Self-knowledge to promote integral health, reduce stress, restore balance and bring in a sense of purpose in one’s life. Dr Jain is the founder and director of MDI Wellness Center.